Designed by Ildefons Cerdà in the 19th century, Avenida Diagonal has for decades been the busiest street in the city of Barcelona. Its latest regeneration a century and a half on has renovated the long stretch running from Plaza Maciá to Paseo de Gracia, which is particularly frequented by pedestrians in the city. The latest redevelopment project was initiated by brothers Robert and Esteve Terrades and completed by municipal architects Carles Casamor, Marta Gabàs and Anna Ribas. 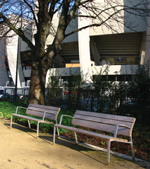 Paths have been widened to create a shared area that lends itself more to chatting and leisure, and the new 1.75 m and 3.00 m NeoRomántico Liviano benches designed by Miguel Milá invite passers-by to have a sit and a chat along their way. 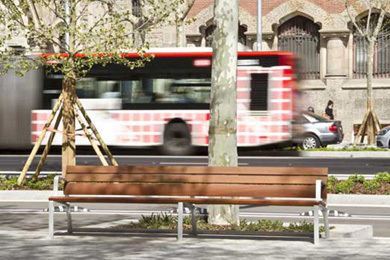 This more graceful but no less solid adaptation of the great urban classic that is the NeoRomántico bench, with its ergonomic form and wooden slats with aluminium armrests, bestows better, more thoughtful, friendlier furniture on Barcelona's main artery, helping to shape the civil space in a more accessible fashion in the multi-speed city.